I have always put up Christmas decoration half-heartedly and much later than people would usually do in Germany. Yet, I think it's time to replace ALL of our Christmas decoration (as our house looked exactly the same every Christmas for several years with the same stuff in the same places). While I am at it, probably even buy a new Christmas tree. Our old one has lasted several years, and I am sick and tired of it too. I checked my Christmas cookie recipes, and even they need an overhaul. We've eaten the same ones for years now. Don't get me wrong, I will still make our all-time favorites: The Gingerbread Cookies (the kids love these) and the Snowballs (husband could live on them during the festive season). But it was time to add something new. My grain-free nutrition phase is still very high on my priority list, as I feel it impacts on my well -being more than any other diet. I tried gluten free and it didn't make much of a difference. I tried dairy free, and I couldn't see any changes. Developing a grain free cookie cutter recipe would be a logical next step. Over the summer, I tried again and again to make something out of coconut flour, but it would go straight to the bin in all cases. Coconut flour doesn't really crisp up in a cookie. If you try and google coconut-flour-based cookies, you will not find much. For exactly that reason. A combination of almond meal and coconut flour finally gave the satisfactory results. My kids and I have been gobbling up these cookies in the shortest amount of time, always in need of the next batch within a day or two. These cookies are tried, tested and approved. I hope you will enjoy them as much as we do. In a bowl combine almond meal, coconut flour and baking soda. Mix well and set aside. With a handheld mixer, beat the eggs with the sugar and vanilla until light and fluffy. Add butter in small pieces and blend until fully incorporated. Add the flour mixture in small portions and blend until a dough forms. You may want to do this with your hands, once the mixture gets thick. If the dough doesn't stick together in a ball, add small amounts of coconut flour until you achieve the results. Dive the dough into two balls, flatten them to a disc and wrap in cling wrap. Keep in the refrigerator for about 1 hour. Preheat your oven to 160C/325F. Line baking sheet with parchment paper. Take one disc out of the refrigerator. Between two sheets of parchment paper, roll the dough to 1/8 to 1/4 inch thickness with a rolling pin. Remove the top parchment paper. 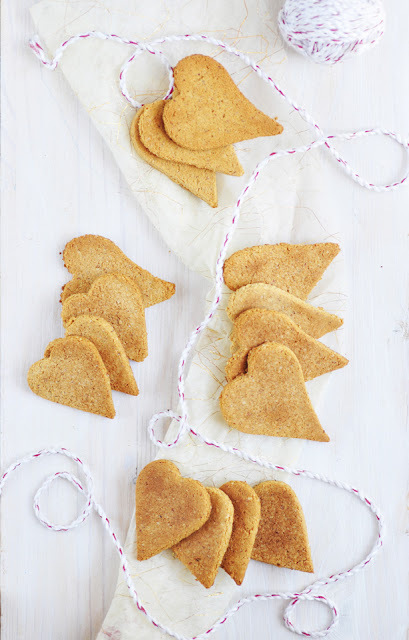 Cut the dough into shapes with cookie cutters of your choice. Lift the cut-out dough with a spatula and place it onto the prepared baking sheet. Repeat with the other disc of dough. Bake for 9 minutes or until bottoms are golden brown. To get your cookies extra crispy, you may flip the cookies upside down and leave them in the switched-off oven for another few minutes.